I’ve been excited for Firefall since it was announced back in 2010. The premise seemed so promising back then — a shooter with jetpacks and resource gathering, cel-shaded graphics and gameplay that went beyond clicking an enemy until someone’s health dropped to zero. The cool and colorful world and awesome mech suits drew me in almost instantly, and I couldn’t wait for the game to come out. Fast forward four years after that debut trailer in 2010, and that game I wondered about every few months is finally coming out! I’ve had a few weeks with the game, and I have to say that while it does deliver on everything promised in those debut videos, the game’s constant repetition of quests started to grind me down after just a few days of play, and now that I’ve put even more time into the game, the drudgery doesn’t seem to show any signs of stopping. Character creation in Firefall is much too simple. Choosing between a few faces, hairstyles, and voices are the only options presented at the start of the game, and changing the look of your battleframe — the game’s mechanical exosuits — requires a few out-of-game dollars or some luck at the game’s slot machines. As a result, most of the game’s player base is an ant-like swarm of white textured soldiers. Firefall’s story is complicated. An asteroid hit the Earth causing mankind to go into a dark age. During this time, scientists uncover Crystite, an element which brings mankind into a new technological era. Crystite also allows faster than light travel, a technique which is employed by the warship the Arclight. On its maiden voyage, the Arclight’s time-bending technology rips a hole in space that causes many beings to mutate due to an extra-dimensional force called The Melding. The player’s goal is to ensure the survival of mankind and defeat the Chosen, a race of humans transformed by the Melding. Confused? Don’t worry, the story hardly applies to the game at all. Mostly you’ll just be running to a job board, accepting a mission strikingly similar to the last one you completed, going to a designated point, and gunning down enemies. 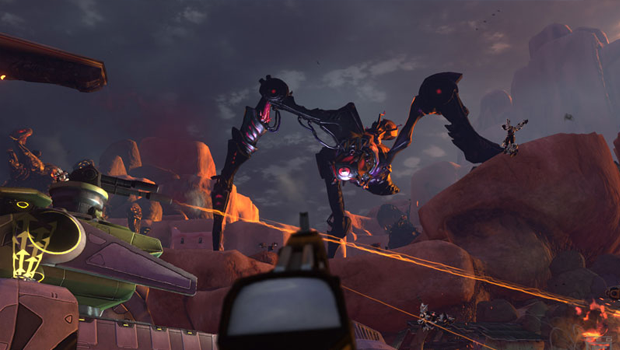 Shooting bad guys, whether they’re bandits, bugs, or Chosen, is something Firefall does quite well. Jetpack shoes add an amazing verticality to combat, and when swarmed by enemies, there’s not much better than hovering above those pesky nuisances and blasting them with some splash damage. The resulting splatter is satisfying, but like Firefall’s other gameplay elements, even the novelty of blowing up chumps gets old. Each weapon has two firing modes: usually a single target fire is assigned to left click, like a burst with an assault rifle or bolt with a laser, and an area of effect attack is assigned to right click. Not having to worry about switching weapons mid combat is nice and having basically all you need in one weapon makes enjoying combat while you’re flying and keeping track of enemies more enjoyable. Players can select one of three jobs at the job board. One of the first missions I chose had me saving a man’s daughter from a swarm of bugs. I finished the mission pretty swiftly, then headed back to get another job. The next I selected was to save a woman’s … son … from a swarm of bugs? You’ll just have to accept that there isn’t much meaningful content in the game. Missions are fully voice acted and–while none of it is going to win any awards–it gets the job done. Instead of reading a wall of text before each mission, you can just listen to the mission overview while you’re already taking out whatever enemies the mission requires. While this does cut down on the monotony of the mission structure, it doesn’t do much to help it. Getting around in the game world is a mixed bag. Zooming around using temporary flight suits found in major cities is fun, but once you get to your destination and complete your quest, unless you’ve paid for an in-game vehicle, you’ll be walking the long haul back. I often just pointed my character in the right direction, pressing auto-run, and started sipping root beer, eating potato chips, and checking my phone while I waited to get back to the job board to get another quest. Battleframes gain new skills the same way you would gather new equipment in a traditional MMO; through drops. The mechanic is interesting, but I never felt like any of my new skills were more powerful than another, even though the stats told me differently. Looking for a totally new gameplay experience? Well, you can switch exosuits, but that runs into its own host of problems. Firefall is a massively-mixed bag. The game is at its best when it forces players to frantically shoot their way through swarms of enemies while protecting an objective, but the fun found in these missions wears off when repeated over and over. I think there are a few hours of genuine pleasure to be found in Firefall, but beyond that I think it’s hard to recommend it to anyone, unless they’re just a diehard fan of MMO tropes. Spencer Campbell has summited many mountains just to shout, “Video games are for nerds! !” After extensive scientific testing, he has concluded that they are. He plans on accepting his Nobel Prize as soon as the dorks in Sweden return his calls.